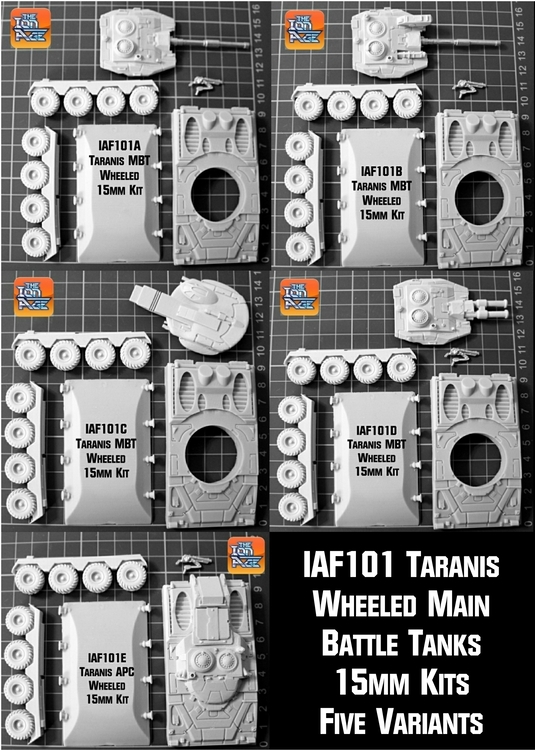 The Ion Age Blog: IAF101 Taranis Wheeled Main Battle Tanks 5 Variants now released! "The Taranis Model 6 Wheeled series was adapted from the ultra heavy Model 40 Tracked series for local conditions of lower gravity and built up areas with weaker infrastructure requiring a weight reduction. The MkII standard hull for all Taranis models weighs in at standard count gravity 1.0 at around 67 tons of titanium alloy armour and internal systems along with the GroatVey MkX HeavyIon Reasc Fusion Reactor that provides the electricity. Using the principle of ion particle beam collision to ignite fuel pellets the MkX reactor provides some 3000 horse power or about 3480Kw of usable electrical energy to the power train. The Model 6 features eight large tires made of Hackamold maxdure composite which is heat and pressure resistant and on good ground can reach nearly eighty miles per hour. There are four trained operators who are drawn from the Fortress and Fleet arms of the Prydian Army. Using the Bragan Memetic Neural Linkage system the crew are mentally attached to the vehicle and control its system. This is a dry linkage as all wet implants were banned after the Gurtan Activation. There is a driver centrally located, a communications and drone controller who handles the screen of drones the tank has and its comms gear. The third crew member is the knight who operates the primary weapon systems and secondary linked weapons. Lastly the artificer who oversees the condition of the vehicle and all minor in combat functions often sharing the work of the secondary weapons and drones. There are a great number of variants and local specialised variants too. Centrally these are the Type A the most common variant mounting a Bodkin AP 130mm Cannon which features several choices of munitions including the Phelot Ex22 AP for anti-vehicle use and the TX12 Imploder for infantry clearance as well as the Habkut Variacluster which is a middle class multi-target round. The Type A mounts a secondary weapon the Angis Mk9 22mm Automatic Rifle. Type B is the command variant of the Model 6 and is allocated at a rate of one to three or one to four of that of the Type A. With improved comms suite and space for an additional operator if required the Type B has a modified turret with better optics and range finders as well as a Moth 88 Rotary Cannon centrally mounted. Type B also has the Bodkin AP 130mm main gun and the Angis Mk9 too. Type C of the Model 6 features a turret crewed by a specially trained gunner the main gun being the terrifying super heavy Fretan SBP9 Sequence Particle Beamer with the space removed from the main hull of the gunner being taken up with a small secondary GroatVey MkV HeavyIon Reasc Fusion Reactor slaved purely to the SBP9 and its massive energy requirements for sustained rates of fire. The Type D is intended for close in warfare in urban and is the siege warfare choice with a re-enforced turret sporting twin Ron MegaMax II 95mm Hi-Ex Launchers. The Ron weapon system has reduced range compared to the reach of the Bodkin 130mm but its destructive potential matches the hellish maelstrom of the SBP9. Type E Model 6 Taranis Armoured Personnel Carrier. The Type E features a rear hatch and additional hull armour at the expense of a turret and two of the four crew normally in the tank. Instead a well furnished internal bay has space for a dozen or more fully equipped Retained Knights or near a platoon of Muster or other non-armoured infantry. The APC type has a top mounted Angis Mk9 22mm Automatic Rifle giving fire support to disembarking troops and is the favoured transport of most in free fire zones. Other Trainer Series have details of the less common variants of the Model 6." 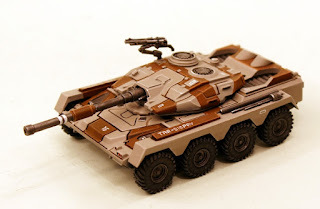 This is the core type of eight wheeled Taranis the main battle tank with projectile turret. It is composed of seven resin and white metal pieces which are the upper hull, the lower hull, right and left wheeled sections, projectile cannon turret as well as the main gun and the sponson gun both in white metal. It is easy to assemble and is designed to be used for wargaming and thus it is durable. Assembled this vehicle is about 90mm long and 50mm wide. We offer the choice of purchasing one kit or on the drop down menu the purchase of three with a saving of 10% on screen. Price 18.00GBP. Go HERE. This is the platoon command type of eight wheeled Taranis with projectile turret with additional rotary weapon and comms suite. It is composed of seven resin and white metal pieces which are the upper hull, the lower hull, right and left wheeled sections, projectile cannon command turret as well as the main gun and the sponson gun in white metal. It is easy to assemble and is designed to be used for wargaming and thus it is durable. Assembled this vehicle is about 90mm long and 50mm wide. We offer the choice of purchasing one kit or on the drop down menu the purchase of three with a saving of 10% on screen. Price 18.00GBP. Go HERE. This is an eight wheeled Taranis main battle tank with an energy weapon turret featuring a small cabin for a crewman. It is composed of five resin pieces which are the upper hull, the lower hull, right and left wheeled sections and SPB energy weapon turret. 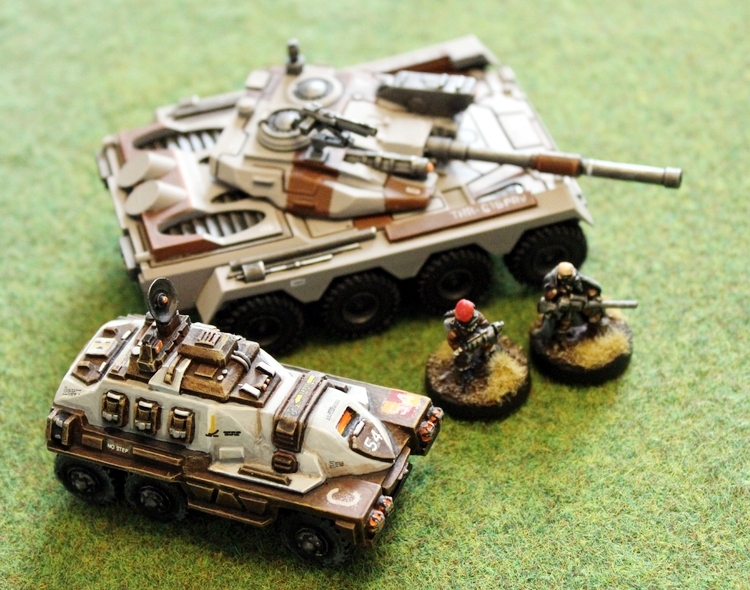 It is easy to assemble and is designed to be used for wargaming and thus it is durable. Assembled this vehicle is about 90mm long and 50mm wide. We offer the choice of purchasing one kit or on the drop down menu the purchase of three with a saving of 10% on screen. Price 18.00GBP. Go HERE. This is an eight wheeled Taranis main battle tank with a double weapon turret for close in destruction. It is composed of six resin and white metal pieces which are the upper hull, the lower hull, right and left wheeled sections, siege double turret as well as the sponson gun. 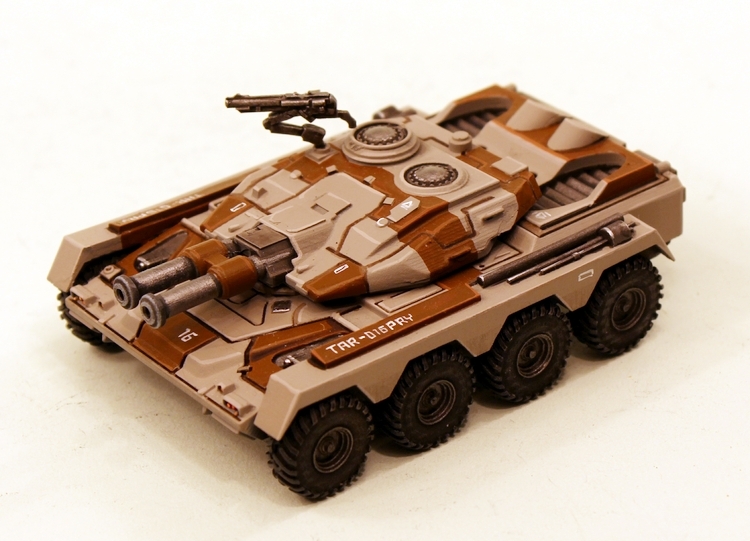 It is easy to assemble and is designed to be used for wargaming and thus it is durable. Assembled this vehicle is about 90mm long and 50mm wide. We offer the choice of purchasing one kit or on the drop down menu the purchase of three with a saving of 10% on screen. Price 18.00GBP. Go HERE. 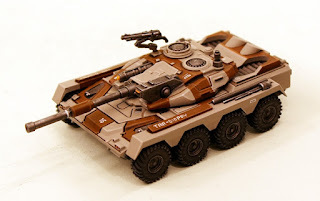 This is a Taranis tank with a re-purposed function as an eight wheeled super heavy Armoured Personnel Carrier capable of carrying two squads or more into battle. 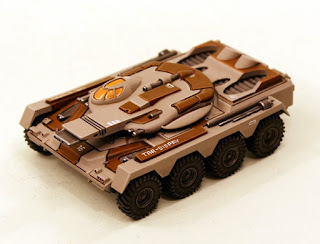 It is composed of five resin and white metal pieces which are the lower hull, the APC upper hull, left and right wheeled sections and the sponson gun. 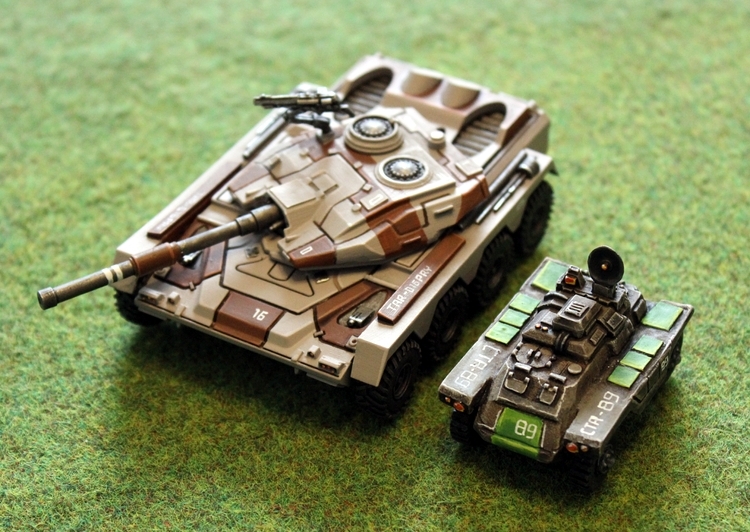 It is easy to assemble and is designed to be used for wargaming and thus it is durable. Assembled this vehicle is about 90mm long and 50mm wide. We offer the choice of purchasing one kit or on the drop down menu the purchase of three with a saving of 10% on screen. Price 18.00GBP Go HERE. Here are pictures of all the IAF101 variants as their parts with under laying scale in 1cm squares for you to look at. All of these images and more are on the web pages for the tanks. Taranis is a top of the line main battle tank and among the biggest land vehicles fielded by Humans in the Prydian Precinct. 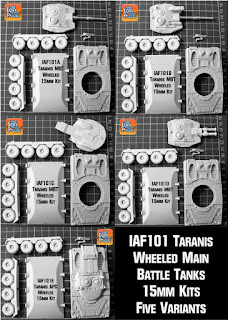 Its a big model and sometimes its hard to tell this from photos so here are images showing the wheeled variants of Taranis next to other codes in our 15mm range. Each has a caption to tell you more. IAF101A next to Adder Wheeled Comms Car its nearly three times larger! See how big Taranis is! A proper main battle tank for your sci-fi wargaming. Taranis Tanks make use of a screen of Drones acting as a defensive, offensive, repair group controlled by the tank itself. These are IAF081 Taranis Running Drones and these can be seen HERE on our website as a pack and as singles. If you would like to read more about the Taranis in the fictional setting of The Ion Age please visit our blog and this INFORMATION BURST article. Its a great read and while primarily about the Model 40 Tracked Taranis series it tells you all about this miraculous vehicle. 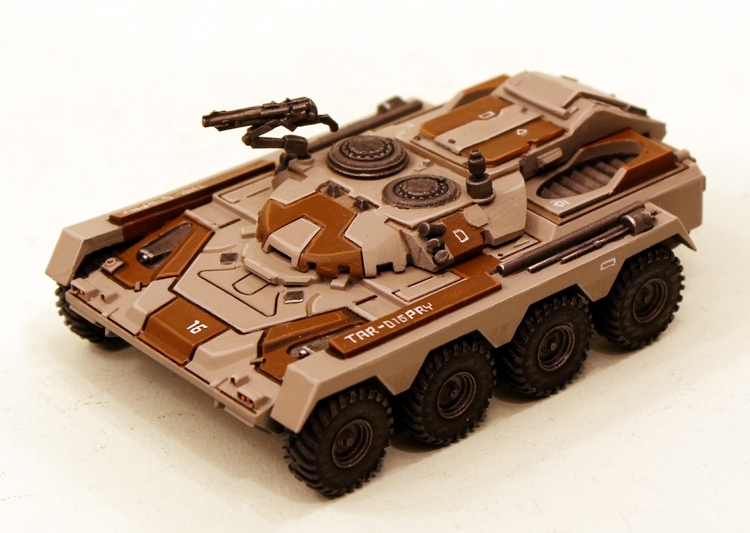 We have released ten tanks this month and will release the first two non-military character packs sculpted by Dave Foley later this month too. We will also be taking part in the fantastic Black Friday Weekend offer at the end of November but details of that towards the end of the month. You get a free miniature with every order and this is currently IMP27 Florian Pumpkin Spore (worth 0.60GBP) you can learn more about that HERE. We have just upgraded and expanded our Rewards Programme (every customer earns points on every order and can use them for bonuses!) see more on that HERE. Lastly if you have not signed up for our Mailchimp email every week (link is on the top right of our blog's home page) then please do so, its free and there is an exclusive offer with up to 50% off a code every month only seen in the email.